It is impossible for an American to not have used USPS delivery services at one point or another. Formally known as the United States Postal Service or the U.S. Mail, USPS has been providing essential postal services for more than 40 years. However, you all might have not experimented with USPS express mail delivery; the aim of this article is to cover the basics so you will be prepared for the process. The United States Postal Service dates back to 1971, when it was founded in Washington D.C. Even though this is the year when USPS was established as we know it today, its roots actually go back to the first half of the 17th century. Throughout these years, various attempts were made to establish postal services through institutions like the North American Postal Service (1691), the Post Office Department (1792), the U.S. Mail Steamship Company (1847) or the Railway Post Offices (1869). The United States Postal Service was, in fact, the result of a New York City labor strike sparked by local employees in 1970. The strike developed into a movement backed up by an amazing 200,000 postal workers across the United States and would subsequently lead to the formation of USPS a year later. Currently, the United States Postal Service has more than 600,000 employees, 31,000 post offices and a work flow of over 660.000.000 pieces of mail that are delivered every day. Based on these statistics, USPS is the third largest employer of civilians in America, with the federal government taking first place and Wal-Mart on the second. Nevertheless, it is the number one postal service in the world when it comes to volume and geography, delivering no less than 40% of the entire volume of mail across the globe. 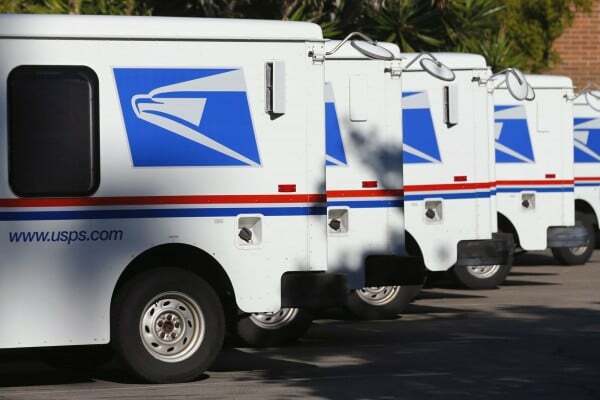 The United States Postal Service has teamed up with the Department of Defense to establish the Army Post Office and the Fleet Post Office, in order to deliver mail for the U.S. Army, Air Force, Coast Guard, Navy and Marine Corps. Another fun fact is that USPS has the greatest civilian vehicle fleet on the planet, with over 200,000 vehicles used for delivery. All of these vehicles are easily distinguished by Americans, owing to their recurrent Chevrolet and Ford models used, but also to their well-known blue logo printed on the sides. Now that you know the basic facts about the United States Postal Service, you are probably interested in finding out about USPS Express Delivery. First of all, we would like to point out that all forms of priority mail are tracked and insured, so both the sender and the receiver can stay up to date with the progress of delivery and rest assured that their package or mail arrives accordingly. As far as USPS Express Delivery time is concerned, the United States Postal Service has an overnight guarantee available to the public every day of the year. This means that the USPS Express Mail Delivery Time is delivered overnight to the majority of addresses in the United States, as well as P.O. Boxes. Although there was a slight controversy in 2013 regarding USPS Express Mail Saturday Delivery, the Consolidated and Further Continuing Appropriations Act of 2013 quickly solved the problem. If you want to save some money and time wasted at the post office, you can acquire the USPS Express Delivery service online for around $4 less. It is recommended that you schedule your overnight delivery by 10:30 in the morning so you can fully benefit from the service. You can also use USPS Express Delivery services on holidays or Sundays, but of course for an extra fee. A great feature that USPS offers is free package pickup from either your office or your home, as well as a shipment insurance that can go up to $100. In addition to this, their Flat Rate Pricing policy is excellent if you are shipping packages. If your package is less than 70 pounds, the United States Postal Service will not calculate or weight it and you will benefit from a single rate, no matter the state you are shipping to. This is yet another service that is more affordable online, starting at $18.11. On another note, the air transport Express Delivery USPS offers is contracted with FedEx, even though the two institutions are generally competitors. Before you decide to use USPS Express Delivery services, you should know that they have a couple of restrictions you would do well to keep in mind. Their maximum weight of packages for delivery is 70 pounds, while the maximum length and girth combines is 108 inches. Their website also points out that “when sealing a flat rate envelope or Box, the container flaps must be able to close within the normal folds”. With all of these aspects covered, you can count on USPS Express Delivery to take care of your mail or packages overnight at great rates. Hey Buddy!, I found this information for you: "USPS Express Delivery: A Brief Overview". Here is the website link: https://all2door.com/usps-express-delivery/. Thank you.